You are here: Home / Advertising / Reporting From the First Ever Tween Summit: Debra Moffitt for S.Y. Oct. 14, 2009 This past weekend, Denise Restauri and the AllyKatzz team launched the first ever National Tween Summit to see what’s on the minds of preteen girls. I haven’t figured out how to be two places at once yet, so I tapped KidsHealth.org editor, journalist and author Debra Moffitt who knows a LOT about “tweens” having recently written the book “The Pink Locker Society” which you can also read online at the VERY ‘tween’ bras-n-boys, girl to girl Q&A site PinkLockerSociety.org. What do Tweens Want to Tell the World? I write about tween girls, get email from them every day, and have spent time in their classrooms, but nothing compares to being in a ballroom packed with nearly 250 of them! Last Saturday, they flowed into the Capital Hilton in Washington, often with moms in tow, to attend the first Tween Summit, sponsored by AllyKatzz.com. They received their name badges and Sephora canvas bags (only the beginning of the swag) and gathered at dozens of round tables, a sea of headbands, ponytails, and hoop earrings. One blond in a sequined silver cap also sported a lime green arm cast. They fidgeted and giggled and doodled, creating a sparkly cloud of energy that sometimes needed to be reminded to hush. But they also listened and tried (some, I suspect, for the first time) to formulate opinions on complex topics. They wanted to deliver on the challenge put forth by Denise Restauri, summit organizer and founder of the social media site, AllyKatzz.com. That’s a big question when you are 12. But the summit was filled with appropriately weighty information to mull over. Alyse Nelson told them about her organization, Vital Voices, which travels the globe to encourage and train women as leaders. That can mean women in the most dire circumstances, where a $10 loan is a life-changer. And in fact, there were older girls (teens) in attendance who had already done just that. The founders of One is Greater Than None were 14 when they watched an “Oprah” episode about children from Ghana whose families had unwittingly sold them into slavery. The group has rescued 48 children so far at about $4,000 per child! Olympic gold medalist in softball, Jessica Mendoza, addressed the obstacles facing women’s professional sports. Mendoza, who is president of the Women’s Sports Foundation, talked about Title IX and told the girls to support women’s sports by showing up at games. I was among the listeners with Nelson, Mendoza, Meeri Park Cunniff who is vice president of programming at Teen Nick, Sally Lee of magazine giant Meredith Corp., and Cordy Galligan of the American Association of University Women. Each table had a different question to discuss and then one girl took the microphone to share with us what they said. What’s the one thing you’d do to change the world? Another table thought the best way to help girls in other countries would be to help them go to school and educate them about their rights. Given a media question, that table’s speaker told Cunniff of Teen Nick that she didn’t like the way girls were portrayed on shows, that few of them looked like normal girls. Another table spilled the beans about what mom doesn’t know: that they like boys; have friend problems, and daydream. But it was equally telling when the girls gave answers that sounded nothing like a college entrance essay. One table was asked for ideas on how to end the bullying, aggressiveness and competition among girls. Their leader, in a hoodie, took the microphone but only to say they didn’t think there was a solution. Weiner moved to another table in search of a pearl of wisdom, but little sprang forth. Another group was asked to answer the question: Who’s in charge of your life? The 13-year-old who took the mike said she would have liked to say she was in charge. But it’s her parents who are in charge of most decisions. They won’t let her do what she wants to do or learn from her mistakes. Weiner asked: What do you want to do? And there it was: the perfect tween moment. Caught between childhood and young womanhood, between concrete thinking and the abstract. It also explains why the summit was really just a first step. Sure, some alpha girls already have started their own nonprofits and have a global perspective. But others are still figuring stuff out, as well they should. Now is the time. The summit may have achieved its greatest success, not because girls gave perfect answers, but because they had a chance to start thinking about the questions. • Here are your free Charm Girls Club Mardi Gras beads! • Drink milk and exercise! • Sit down a while on this soft, cushy chair – it’s from PBTeen. • Can you guess how many Dove Ultimate deodorants (nectarine and white ginger scent) are in this tall glass tube? • Enter and win a guitar shaped like a butterfly! • Donate to One Is Greater Than None by buying a fund-raising bracelet or T-shirt. • Have you considered America’s Junior Miss Pageant? 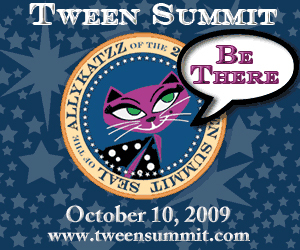 The summit’s stated purpose was to “examine the minds, motivation and lives of tween girls, giving them a platform to share their thoughts and opinions on a wide range of subjects, and give parents, politicians and marketers a more thorough understanding of this enigmatic and highly influential demographic.” AllyKatzz will gather insights from the summit into a report that will be sold for $12,500. Restauri, the summit’s organizer, said she was grateful to sponsors for footing the bill for the summit ($200 to $300 per girl). Girls attended for free. She was also careful about what kind of access the companies had to the girls. “We’ve been very selective about who’s on the floor,” she said. For instance, no modeling agencies were permitted. Restauri said her roles as girl advocate and marketer can co-exist. Giving Electronic Arts access to girls gave the company a chance to find out more about what girls want in gaming. Mission accomplished. By day’s end, the girls were back in the ballroom, this time for a tween-pleasing concert. Emceed by the Disney Channel’s Debby Ryan (Bailey on The Suite Life on Deck), the concert featured Brooke White (a former American Idol contestant) who had them singing along to Carole King and Carly Simon. But the girls were at their uber-tweeniest when Jacob Latimore and boy bands WOW and Comic Book Heroes hit the stage. As moms yawned in the back rows, girls stood on chairs and even rushed the stage. It must have felt good, after a long day, to dance in the aisles and do nothing more than try to catch the eye of a long-haired boy with a guitar. From the same stage, just 12 hours earlier, Restauri told the girls just how boundless their possibilities were. 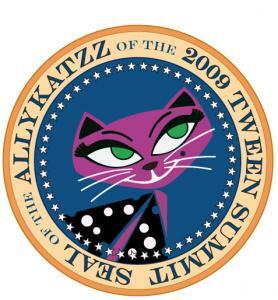 The summit’s own logo sent the same message – a cute and confident pink cat that looked at home inside the presidential seal. 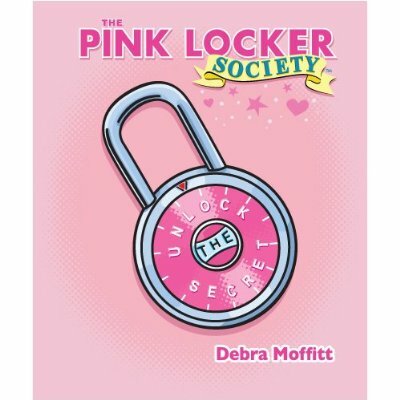 Debra Moffitt is the author of The Pink Locker Society, a novel for tween girls about puberty. She is also a mom of three and the kids’ editor at KidsHealth.org. You can ‘follow’ Debra on Twitter using: @PinkLockerMom We hope to hear a lot more from her here on Shaping Youth! I think Debra hits the right ‘aha’ moment with the bigger picture here about expectations and kids needing to muddle through puberty rightfully saying “I don’t know”….It’s part of the reason media/marketing’s KGOY effect (kids getting older younger) is disconcerting, as pop culture defines kids before they have a chance to define themselves. Exactly. Thank you, Jess. Chicken or the egg issue definitely applies in media and marketing’s impact and kids…Your thoughts? Anyone attend the summit that would like to weigh in here? We were at the Summit too (http://tiny.cc/TwixtatTweenSummit). I thought your report was well done and was one of the few that captured what the girls actually said.